Volunteers from the Aquarium helped get the sevengill shark into a specialized sling and move her into tank of oxygenated salt water. Fishing was good in the San Francisco Bay Thursday afternoon for Mike McGill and Melissa Chaney. So good, in fact, that it took a team of volunteers and experts to help bring in the catch. McGill and Chaney, marine experts at Aquarium of the Bay in San Francisco, were scouring the Bay for new exhibits when they caught a rare sevengill shark near Alcatraz Island. The female shark measures nearly 10-feet-long and weighs 319 pounds. 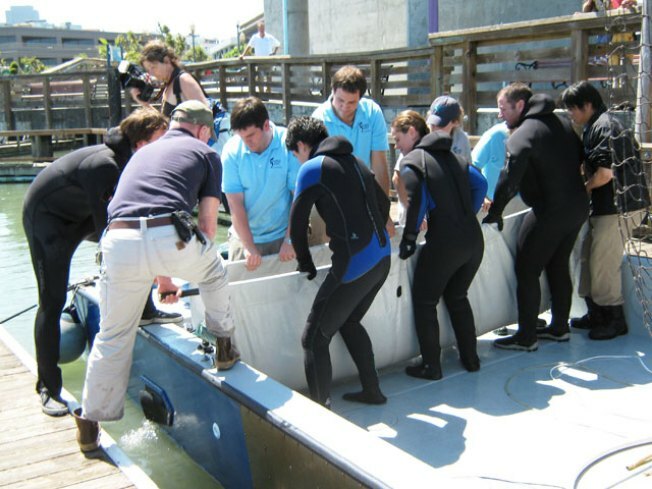 Volunteers from the Aquarium helped get the shark into a specialized sling and move her into tank of oxygenated salt water. After measuring and weighing the massive fish, the team placed her into the Aquarium's 200,000-gallon crystal clear tunnel exhibit. She's the largest shark the Aquarium has had on display and is heavier and longer their previous huge catch, "Shirley," in 2008, spokeswoman Michele Bernhardt said. The public can now see the rare shark swimming in her new surroundings at the Aquarium and watch her being fed on Sunday at 11:30 a.m. during the Aquarium's public shark feeding. Sevengill sharks are the largest sharks living in the San Francisco Bay.